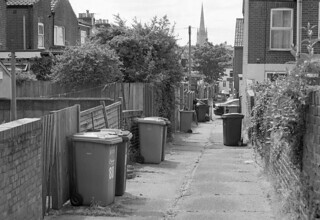 An agreeable area of Norwich, just north of the city centre, where every turn in the way reveals some pleasing prospect. No name is marked in my Philip's Norfolk Street Atlas, though I'm sure it must have one. There are many streets of terraced houses, divided by alleys at the rear, mostly much narrower than the example illustrated. They even have "entries" ...I think this is the term used in the North... in between the houses at intervals along the street. One is reminded of Lancashire in the old days ...slightly anyway. Wheelie bins have displaced traditional galvanised dustbins, there are no setts, no wandering stray dogs, no wonderful fragrance of coal smoke in the air, no corner shops with window displays of Leo dried peas and Camp coffee, no heavy clouds pregnant with rain. The lovely flat light is gone. Plastic window-frames and new roof tiles of a raw orange colour are everywhere and there is altogether too much greenery. But the main difference, of course, is that one cannot revive the world of fifty years ago; neither the external world nor the internal world of one's earlier self.